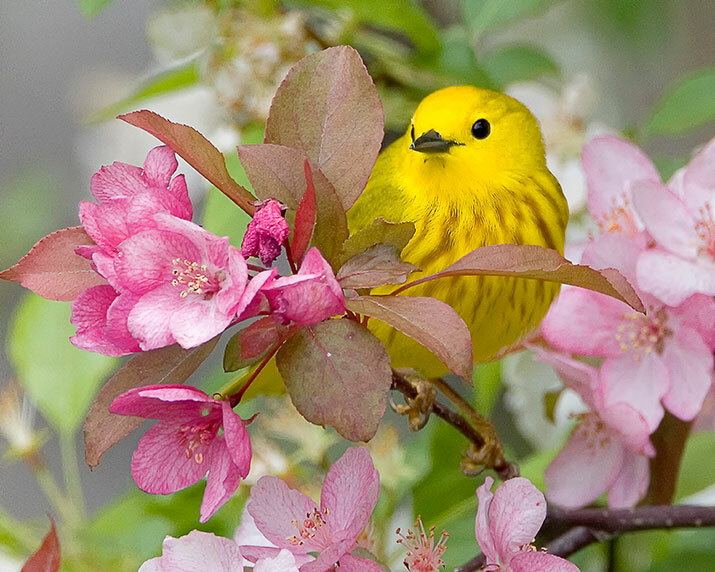 Browse through a few of our Canadian species in these "At-A-Glance" fact sheets. Each page has basic information on some of our Canadian wildlife, with links to detailed, reputable sources such as Hinterland Who's Who and the Government of Canada. Don't see a species you need? Comments or questions? Let us know! 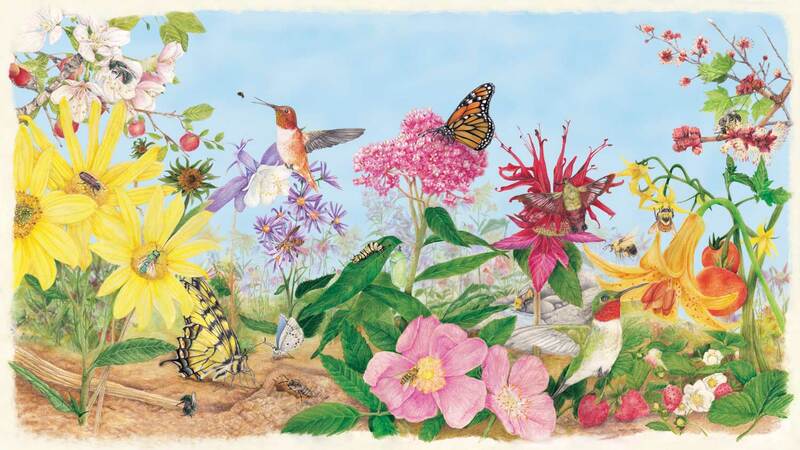 Milkweeds are a large group of plants with heights anywhere from 20 to 180 centimetres (0.5 foot to 6 feet) and flowers that range from white and greenish to pale pink and deep magenta. Some shared traits of Canada’s milkweeds, however, are a large round or flat cluster of late spring or summer-blooming flowers. Their petals fold backwards on the stem and the centre of the flower is comprised of five hood-like structures within which is a protruding ‘horn’ as well as the plant’s nectar. Their leaves and stems typically have a milky sap, hence their name, Milkweed. Ripe milkweed seed pods are elongated and, once hardened, open with a slit along one side to reveal many brown seeds attached to thin silky white fibres that fluff up to catch the wind and carry their seeds farther afield. Many species have thick wide oval shaped leaves arranged oppositely along the stem although some have slightly or extremely narrow leaves as well as have an alternate or whorled arrangement on the stem. They are all generally pointy to some degree at both ends. For a breakdown of Canada’s milkweed species, see below. One typical characteristic includes leaves that are widest at the middle or base, giving it a pointed look near the outer tip. 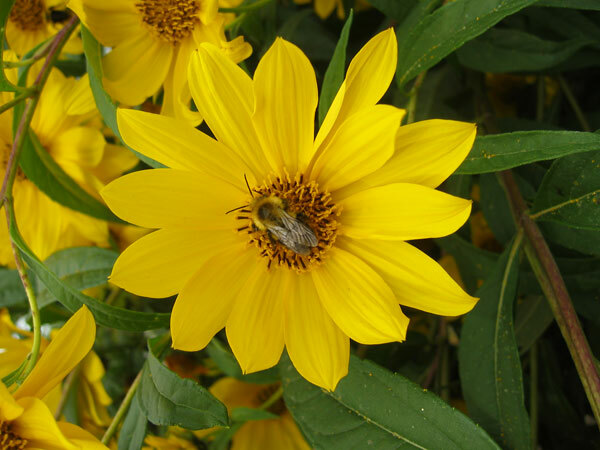 Flowers have yellow petals with either yellow or dark brown centres, although new varieties include petals that resemble the colour of a rich red wine. 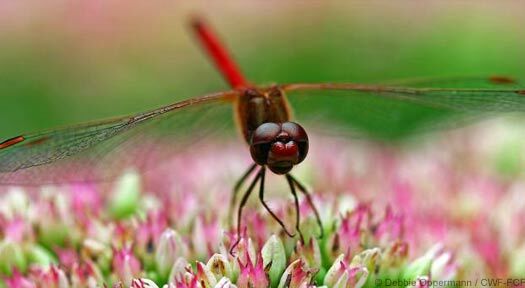 The perennial species typically have a more delicate look than their annual cousins. 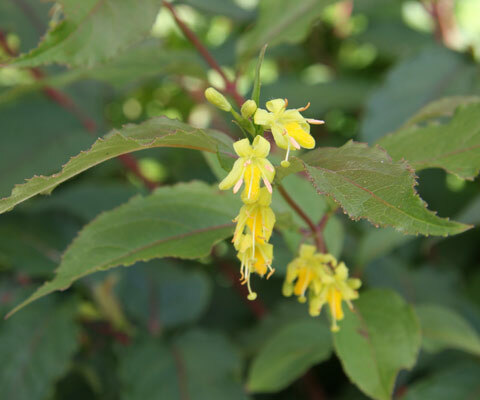 The northern bush honeysuckle blooms during the summer with small clusters of tubular yellow flowers found in leaf axils (where the leaves join the stem) and at the tip of the stem. The flowers turn orange-red once pollinated by bees, butterflies and other pollinators that make use of the plant’s nectar and pollen. The stems and new leaves are typically reddish, but the bright fall colours – with leaves ablaze in shades of yellow, orange and red – are more inclined to catch the eye. The leaves are arranged in opposite pairs along the stem and are pointed at the tip with fine serrations (teeth) along the margin (edge). Pasque flower grows up to 30 centimetres tall and forms a rounded clump, which increases yearly. It never gets out of hand, making it a desirable plant in any gardener’s flower bed. It carries one flower with purple petals and yellow stamens, on top of each stem. Pearly everlasting can grow to up to nearly a metre tall and can eventually bush out equally as wide. 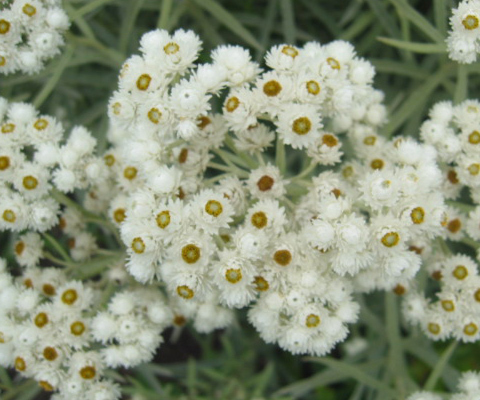 The clusters of white flowers have yellow centres and bloom for many weeks from mid-summer through to early fall. The leaves are long and narrow with a silvery hue, thanks to the fine hairs that cover its leaves and stems. 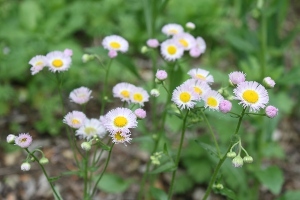 The Philadelphia fleabane stands about 30 to 100 centimetres tall. Its leaves are lanceolate and hairy measuring 5 to 15 centimetres long. 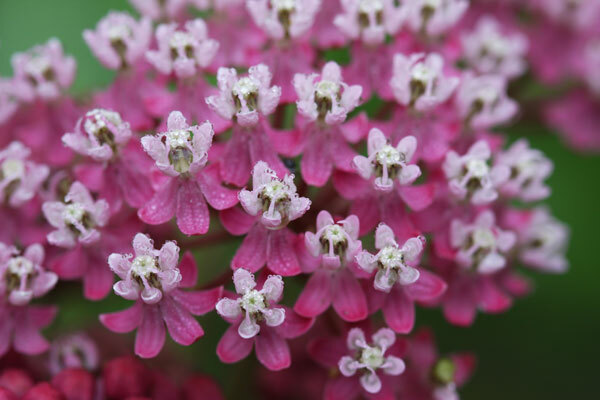 The flowers are clusters of pinkish, pale purple or white blossoms that can be seen in bloom from May to October. 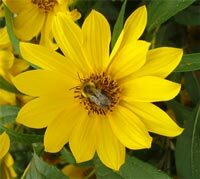 Each blossom is 1 to 2.5 centimetres across and has up to 400 narrow ray florets around a yellow centre. White flowers usually bloom before leaves are fully grown. Each flower has five long bright white petals. The flowers usually grow in clusters at the end of new growth, although at least one Canadian species has flowers growing from the leaf axils. They bloom anywhere from March to June, depending on the species and its location. The red or dark purple fruit are typically sweet and juicy, although some, like Amelanchier arborea are drier and don’t have as much flavour. They are all edible although, with local conditions such as soil and weather dictating their exact taste and juiciness. 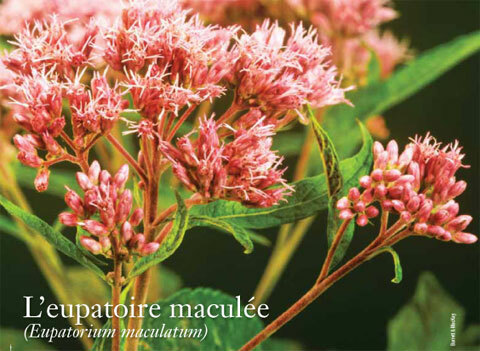 The Spotted Joe-pye weed stands between 60 centimetres and 1.8 metres tall. 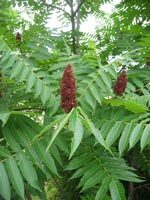 The leaves, which are six to 20 cm long, are also short-stalked, lanceolate, sharp-toothed and occur in whorls of three to five. The flowers are pinkish-purple tubular florets and occur in flat-topped clusters 10 to 14 cm wide. They can be seen in bloom from July to September. Their fruit are seed-like achenes with tuft of soft hair. 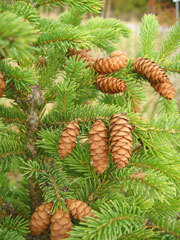 Spruce trees are sometimes confused with other evergreens like pine and fir trees. Pine needles are longer, even those of the Jack pine, and both pine and fir needles tend to be gentler on your fingers than spruce needles when you approach from the tips. The needles of a spruce tree are arranged all around the twig. Spruce needles are four-sided except for the flattened Sitka needles, which have a little dip at the bottom, like the keel of a boat. Another clue that you’re looking at a spruce is if there are little pegs protruding from the twig at the point where the needle attaches. This large shrub has compound leaves, meaning each leaf is composed of several leaflets. These leaflets hang down, have serrations (teeth) along the edges and turn a radiant red or orange in the fall. The thick branches are hairy and resemble the velvety antlers of a male deer (stag), hence the common name of “staghorn.” Clusters of small greenish flowers form an upright cone that yields crimson red berries covered in fine hairs.